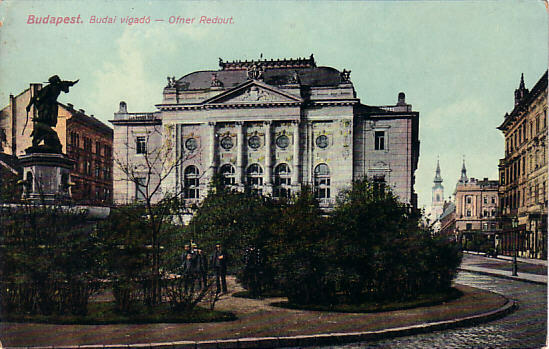 Concert hall, built 1898-1900 by Aladár Arkay and Mór (Maurus) Kallina on the site of a former arsenal. The complex includes the concert hall, a 300-seat theatre, a library, a restaurant, and a café. Currently known as "Hagyományok Háza" (Heritage House) and mainly used by the Hungarian State Folk Ensemble. Front Text: "Budapest - Budai viagdo - Ofner Redout"